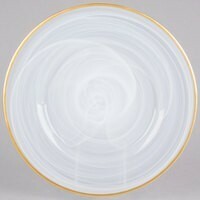 ChargeIt by Jay Alabaster Silver Glass Round Charger Plate with Gold Rim 13"
Home > Products > ChargeIt by Jay Alabaster Silver Glass Round Charger Plate with Gold Rim 13"
Set a classic yet elegant table with the ChargeIt by Jay Alabaster Silver Glass Round Charger Plate with Gold Rim 13". Beautifully accented with a bold, gold rim and sophisticated swirl pattern on its surface, this charger plate adds an intricate and charming detailing, making it a stylish addition to any banquet or wedding reception. Combining unsurpassed elegance and outstanding durability, this charger plate is made from premium quality solid glass with a glossy, upscale appearance. The perfect harmony of form and function, this piece complements any dinner setting and protects against spills and mess. To keep this charger plate in excellent condition, hand washing is highly recommended.